The slideshow gallery below presents a chronological series of three-dimensional artworks, from c.1875 to the present, that seek to depict or interpret Emperor Norton. The gallery is part of the Visual Arts section of The Emperor's Bridge Campaign's ARENA: Archive of Emperor Norton in Art, Music & Film. Emperor Norton figurine, plaster, c. 1875. Collection of the de Young Museum. Photograph: de Young Museum. Emperor Norton figurine, plaster, c. 1875. Collection of the Wells Fargo HIstory Museum, San Francisco. Source: The Forgotten Characters of Old San Francisco (The Ward Richie Press, 1964). Maquette of Emperor Norton in tophat (1936), by Peter Macchiarini (1909-2001). Source: Macchiarini Creative Design. 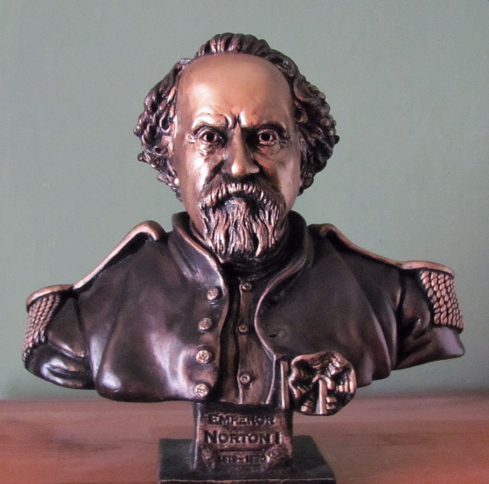 Maquette of Emperor Norton in Union cap (1936), by Peter Macchiarini (1909-2001). Photograph: Mike Leon. Source: SF Weekly. Front of 14K gold medallion for the Emperor Norton Treasure Hunt sponsored by the San Francisco Chronicle, 1953. Medallion struck by Shreve and Co. Photograph © John Kraljevich. Source: Numismania Bibliomania Society. To see reverse of medallion, click here. Emperor Norton figurine, chalkware, 1968, by Elwin Millerick (1911-1997). 12"h, including base 3.5"w x 5"d. Collection of Joseph Amster. Figurehead of cruise vessel Harbor Emperor, San Francisco, 1968, wood, by Elwin Millerick (1911-1997). Built in 1968, the Harbor Emperor is part of the Blue & Gold Fleet of cruise vessels. Photograph © 2012 Paul Sullivan. Glass etching in entry transom at the Emperor Norton Inn, 615 Post Street, San Francisco. Creator and date unknown. Photograph © 2010 D. Huw Richardson. Emperor Norton art bar, .999 fine silver, 1973. Minted by Coin Galleries of San Francisco. Edition of 2,500. Source: Silver Art Collector. "Emperor Norton" (1982), by Karin Roper (b. 1963). Polymer clay. Roper created this piece at the request of her father, the late Edward Roper, a Norton fan and San Francisco and California history buff who taught middle-school history in San Francisco for 30 years. She gifted it to him on Father's Day 1982. © 1982 Karin Roper. Photograph courtesy of Karin Roper. Detail from San Francisco Yesterday and Today (1984), by Ruth Asawa (1926-2013). Located in the driveway of the Parc 55 Hilton, San Francisco. Photograph © 2015 Joseph Amster. For more photos of the complete 7-paneled sculpture, click here. Emperor Joshua Norton (1984), clay, by Tom Jackson (b. 1931). Collection of the California Historical Society; gift of the artist. Emperor Norton puppet, 1997, by Mona Caron. For 1997 San Francisco Carnival parade. Source: Mona Caron. Head of Emperor Norton puppet, 1997, by Mona Caron. For 1997 San Francisco Carnival parade. Source: Mona Caron. “Emperor Norton” (2002), by Larry Krames (b.1940). Terra cotta, 10” tall. © 2002 Larry Krames. For more of Larry Krames’ work, see his Instagram. Medal, Bohemian Club, 2002. The Bohemian Club presented this medal, as a gift of thanks, to each member of the cast of Emperor Norton: A Command Performance, the 2002 Grove Play, performed on 26 July 2002. An item mentioning the medal appeared in the August 2002 newsletter of the Redwood Empire Chinese Association, here. Source: eBay. 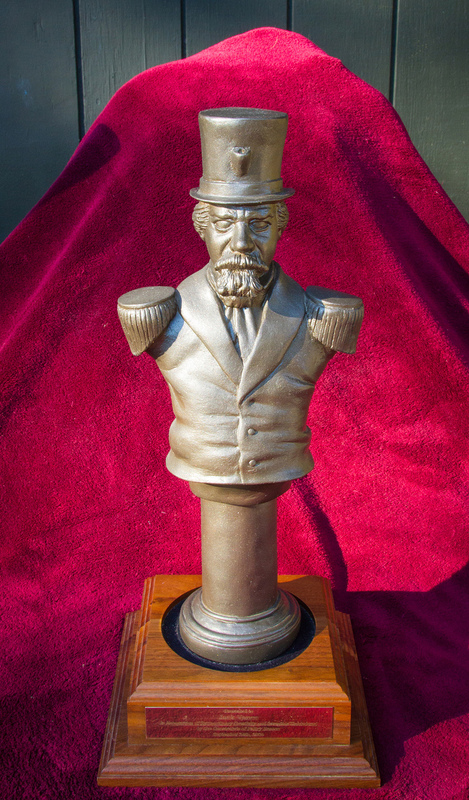 The Emperor Norton Award, known as "the Joshua," originally designed and sculpted in 2003 by Paul Groendes. The award is given annually by Tachyon Publications and Borderland Books for "extraordinary invention and creativity unhampered by the constraints of paltry reason. Source: Jack Vance. Gay Dollar, 2005 (reverse side). Designed and minted by GayDollarSF to commemorate the 40th anniversary of the founding of the Imperial Court by drag performer Jose Sarria (1922-2013), the first openly gay person to run for public office in the United States. The front of the coin, which can be viewed here, featured a depiction of Sarria in his persona as The Widow Norton. Source: Nancy Niche. "Emperor Norton I" (2009), by Dan Barrett. Cut and pasted watercolor paper. © 2009 Dan Barrett. Source: Deviant Art. Sculpture of Emperor Norton, 2010, by Daniel Macchiarini (b.1953) and his daughter, Emma Macchiarini. Based on one of two 21" maquettes of Emperor Norton sculpted in 1936 by Dan’s father, Peter Macchiarini (1909-2001). This casting, by Piero Mussi at Artworks Foundry in Berkeley, Calif., presides over the main bar at Comstock Saloon, San Francisco. Source: Gianni's North Beach. Sculpture of Emperor Norton, 2010, by Daniel Macchiarini (b.1953) and his daughter, Emma Macchiarini. Based on one of two 21" maquettes of Emperor Norton sculpted in 1936 by Dan’s father, Peter Macchiarini (1909-2001). This casting, by Piero Mussi at Artworks Foundry in Berkeley, Calif., presides over the main bar at Comstock Saloon, San Francisco. Source: Macchiarini Creative Design. Emperor Norton (2011), by Robert Cooper. © 2011 Robert Cooper. Source: Robert Cooper. Mural in bottle caps, 2011, by Scott Bowers. Located at 2785 Bryant Street, San Francisco. Photograph © 2011 Dave Schweisguth. "Emperor Norton" (2012), by Jeremy Fish (b. 1974). Located in the "upper room" at Emperor Norton's Boozeland, San Francisco. Photograph: Emperor Norton's Boozeland. A miniature in the Nortoning series, 2016, by Aaron Almanza. © 2016 Aaron Almanza. Source: Aaron Almanza.